Overwhelmed by public speaking fear, stage fright, or writer’s block? Do you start to worry about your performance as soon as the date is set? Does this anxiety keep you from being able to perform at your peak potential? Perhaps you’ve read up on public speaking tips, or reached out for extra training to help with PowerPoint presentations to no avail. 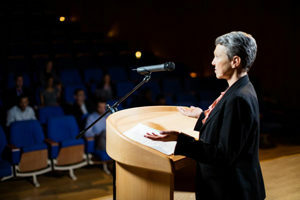 Many people suffering from a fear of public speaking have resorted to medication for anxiety and still suffered from debilitating fear before and during performance. Stop public speaking fear from dominating your life. There are techniques to help you handle the anxiety as soon as it hits, which in many cases can be months before the actual event. It’s not unusual for people to begin feeling anxiety the moment they learn about a public appearance. Methods such as mental and live on-site rehearsal will help handle the anxiety, look more confident than you feel, and be so prepared you will always be able to finish the performance or speech. Significantly reduce your public speaking fear. Perhaps you’ve been told the best you can do is to manage your anxiety. But there are powerful approaches to reducing your fear of public speaking. The most effective ones diminish the reasons you shut down before and during a performance. These psychological techniques help you get to the root of your fear and address it. My coaching program for fear of public speaking has a track record of good results. I can lead you through anxiety management, fear reduction, and transforming your self consciousness into strong mission focus. These are changes that last over time because you are a full participant in the change process. Learn more about these techniques for change in Methods. Read my article, Public Speaking Anxiety Attacks and learn ways to help diminish your anxiety.